A very cold hardy, heavy bearing, sweet cherry. The fruit is similar to Bing, though usually a little smaller. Requires a pollinizer; most other sweet cherries will work. Budded on semi-dwarf rootstock. 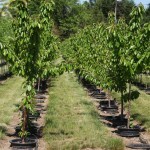 Fruiting cherries do best in full sun and a well-drained soil. Avoid heavy clay soils and soils with poor drainage.